SAVOR THE DAY: Welcome, Dear New Year! “Don’t tell anyone or your wish won’t come true.” Have you ever heard this saying? When I was a young child, every chance I got—birthday candles, shooting stars, and wishing wells—I wished for cherry pie. I never told anyone because I wanted my wish to come true. It was, however, only when I finally fessed up, that I got the cherry pie. Here’s another confession: I keep a list of potential baby names in a drawer next to my bed, and sometimes when I can’t fall asleep, I plan my wedding. This used to be a secret—a guilty pleasure that I kept to myself—since I’m neither dating nor expecting. I’m learning, however, that the more I share my dreams, even the embarrassing little secrets like these, the more support I get. As we transition into the New Year, I plan to take more ownership of my dreams, rather than hide them away in a drawer. I want to proudly announce to the world, “This is who I am and this is what I desire,” but at the same time, I want to try to detach from the idea that there’s just one possible version of my life. Dreams can manifest in a myriad of ways. If we’re honest and forthright about what we want, others can’t help but assist us in making our dreams come true. Some things—like the list of baby names—I’ve preferred to keep to myself because I didn’t want to be laughed at or pitied. But, I’m slowly learning that when something brings you joy and when you tell people about it with confidence, they don’t pity or laugh at you. The New Year is a time for reflection and anticipation of things to come. I’ve been enjoying how different I feel this time around. No more longing. Just contentment. This past summer, I had a meltdown. I was pretty sure that I’d never have the things I desire most. The good thing that came from this, however, was that I realized I’d have to be willing to let my dreams happen in different ways. Rather than doggedly looking for Mr. Right and a storybook romance, followed by a beautiful wedding in wine country, and then a healthy baby, I began to consider other alternatives and different routes to that imagined future. Additionally, I decided to release my concern for what people would think if I did things a bit differently. It turns out I actually care a lot more about how I appear to others than they care about how I appear to them. I also worried what my conservative grandparents would think if I decided to have a baby on my own. But the truth is, although it might not be their first choice, they’d end up loving the baby. The more I’ve released my firm grip on having my life be a certain way, and the more I’ve been willing to own my secrets and share them with the world, the more content I’ve become. Ever since my midsummer meltdown, I’ve felt more at peace than I have in years. Despite previous attempts, this is the first time it truly feels as though I’ve surrendered to whatever path my life will take. I do still occasionally peek at the list of baby names and imagine dancing by moonlight at my wedding reception, but now it’s more of a before-bed activity much like reading or doing a crossword, rather than a longing pulling at my heart. As we enter 2012, I’m of course still hoping that this will be the year I fall in love with my forever man, but it doesn’t feel like a necessity. And rather than thinking about giving birth to a real baby, I’m much more focused on my other baby—my cookbook that will be published this year. What wishes have you been keeping to yourself? What are your dreams, desires, and longings? In what ways can you share them with others? What steps can you take to manifest your dreams—or perhaps some unforeseen version of them—in the New Year? I wish you the most splendid start to 2012. May this New Year be filled with love, adventure, and of course, good food! In honor of the cherry pie I wished for as a child, here’s a cocktail to remind us to share our hopes and dreams with others so that they’ll come true. As we transition into the New Year and eagerly anticipate the exciting adventures that await us in 2012, raise a glass. Here’s to welcoming our dreams in whatever manner they manifest themselves! To frost the glass with sugar: Gently moisten the rim of a Champagne flute with a damp finger. Sprinkle a teaspoon or so of sugar on a small plate. Dip the rim of the glass in the sugar and roll the edges in the sugar until completely frosted. To make the cocktail: In a small bowl, muddle the cherries with the sugar and cinnamon. 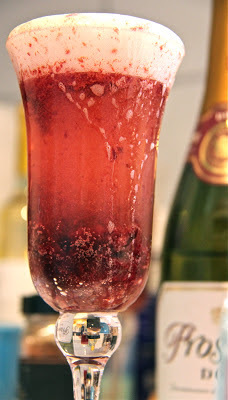 With a small spoon, transfer the cherries to the Champagne flute, and top with the sparkling wine. Serve with a cinnamon stick and enjoy! Happy New Year to you too Meadow. I imagine that photo at the end of your blog was tricky to capture just at the moment you poured the sparkling wine in the glass. and like you said, they don't have to be exactly like you envision them in your dreams... sometimes the universe will put thier own unexpected twist to your wants and when they happen... they are perfect..better than your dreams! Thank you for sharing your dreams, I could see you standing under tree on your wedding day as soon as I saw the picture! Sometimes we think we have to control how, but as in Alanis Morissette's song: "The moment I let go of it, was the moment I got more than I could handle; the moment I jumped off of it, was the moment I touched down". I remember when I wanted a baby really badly and it just didn't happen. So I decided to let go of that dream and have a puppy instead. My lovely daughter was born at the end of that year. Dream big and allow yourself to receive them, you deserve it!! Have a sparkling start into a magical new year!! Well said! I can see your dreams coming true. I recall a time in my life when I thought I could not go on. I was childless and everything I did with the doctors would not work. They told me I did not have many eggs and the ones they make me produce could not be fertilized. I didn't'[t even get a period and I was 30 years old. Then I asked God to speak to me. I was so unhappy with my life that I was going to end it. I know look back at myself being a spoiled brat and ungrateful for the things I did have. However God did meet me that night in love and beauty. I was a 9 year old girl and God appeared behind a huge Desk. My nanny came in to me and said your father is here. I knew it was God. I ran into his office and He said to me (I couldn't see him because the desk was so big that I couldn't see past it)"Gina, You cannot base my love for you by what I give you or do not give you. Now go look on your bed." I ran into my room and there were to life like dolls waiting for me. I started making a baby quilt knowing God was giving me 2 girls. My mother in law thought I was crazy making a quilt for a baby I didn't have. 1 1/2 years later I adopted. The birth mother did not know what she was having and picked us out of everyone because of my spirituality. She gave birth to a girl. My first doll. After 1 month I got my period and the 3 month I went to the doctor in pain I couldn't describe. He said I was ovulating get home and get to work. 3 months later I was Pregnant with Janelle my second daughter. Anytime I have fears or doubts I can go back to that event in my life and know I am not alone and there is great power and strength in faith. Thank you for your vulnerability. I am sending you much love and belief! Beautiful Meadow! So sweet and real. I honor you on this journey of life and feel you will "find" more joy than you could ever have imagined. :) Sending lots of LOVE in this New Year. Congratulations on your new cookbook. Blessings and miracles abound! This is truly a posting to SAVOR, Meadow! Your honesty is refreshing, just like Cherry Pie Sparkler that I'm thinking would be a perfect accompaniment to creating my 2012 vision board on Sunday!!! Cheers to you and to whatever life has in store for you in the days and year ahead! You are a blessing. I just love your open hearted posts. Watching you share your personal wishes and desired around marriage and children never fails to open my heart. Thank you. Here's to being open hearted with dreams. Beautiful! You are my favorite blogger. Wow! Thank you so much!!! !